Using Quick Look in Mac OS X 10.5, you can view the contents of a file without even opening it. I am proud to announce today that Mr. Genius Bernhard Jenny of the Swiss Institute of Cartography at ETH Zurich has created Quick Look and Spotlight plugins for GIS data for Leopard. Download here. 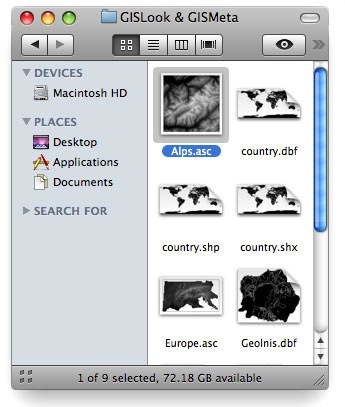 Use GISLook to browse and preview GIS data in Finder window thumbnails, including Cover Flow and Quick Look windows. Use GISMeta to view the size of GIS raster grid files. If you haven’t upgraded to 10.5 yet, this is good reason. If you don’t own a Mac, get one and run ArcMap via Parallels Desktop. This software is donationware. You can freely use them at no charge. If you use them regularly, it is suggested that you pay a donation of €5 or a more suitable amount.